Use up yarn scraps by making these sweet crocheted Christmas ornaments. They come together quickly and easily, and you can embellish them to your heart’s desire. Here’s my original pattern for the ornaments. I’ll walk you through the steps. Use worsted-weight yarn (Cascade 220) and a size F (3.75 mm) hook. You can use any yarn weight and the corresponding hook size—gauge is not important for this pattern. The finished ornament measures about 3 inches long. See these instructions for crocheting a magic ring if you’ve never made one, or just work into the slip knot. The pattern includes three simple rounds; for more detail on double crochet and the picot, read on. Round 1: Chain 3, 11 double crochet into ring, join with a slip stitch in top of beginning chain—12 double crochet. Round 2: Chain 3, double crochet in first double crochet, 2 double crochet in each of next 5 stitches, (2 treble crochet, picot) in next stitch, 2 treble crochet in following stitch, 2 double crochet in each of remaining stitches. Join with a slip stitch in top of beginning chain—20 double crochet, 4 treble crochet. Round 3: Slip stitch into the next stitch, chain 2, and half double crochet into the same stitch, 2 half double crochet in the next stitch, fasten off—4 half double crochet. Here are the tricky crochet parts, but truthfully, they’re not really tricky. These all happen in Round 2. To make a treble crochet, yarn over twice and insert your hook in the stitch. Draw up a loop (yarn over, draw loop through first 2 loops on hook) three times. 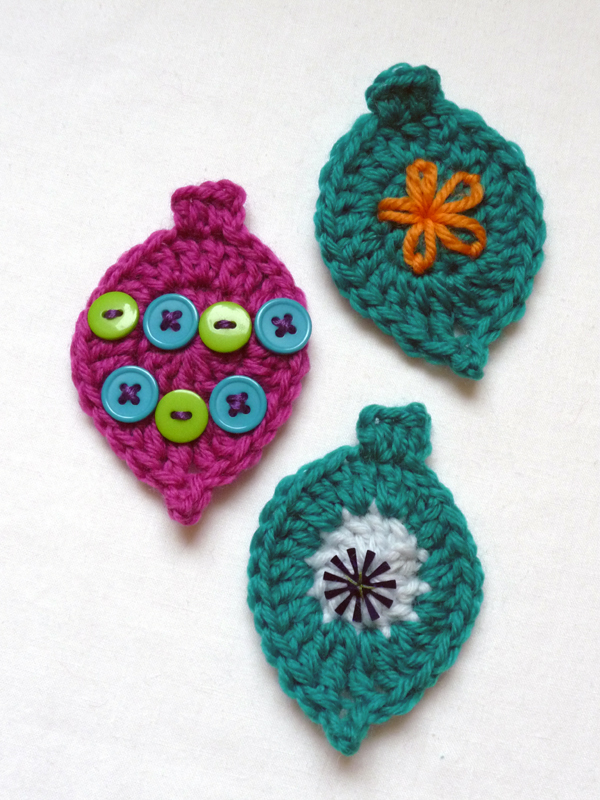 When you have finished crocheting the ornaments, have fun with embellishing. Try sewing on sequins, buttons, and beads, or use a contrasting color of yarn to do a little embroidery. Insert wire hangers and the ornaments are ready to hang. These crocheted Christmas ornaments would also make cute gift tags or would look festive strung together along a crocheted chain as a garland. Experiment with embellishing, and try changing colors between rounds. I love the one I made with a soft blue center combined with a sequin. It’s evocative of the mirrored glass ornaments my parents had. This article by Linda Permann was posted November 29, 2016 on Craftstylish.com. See more of Linda’s projects on her blog, and in her book, Crochet Adorned (Potter Craft, 2009).